I read and enjoyed your article on winter row covers. I have a terrible time with growing squash, especially winter squash. The vine borers always get to the plants well before harvest. I’ve read elsewhere how row covers can be used to protect squash from vine borers and other unfriendly insects. Is this true? I assume the same rod setup will be used during the winter or summer. But would I use the same Reemay as you used for the winter during the summer, too? I live in western Maryland, zone 7. If I cannot use row covers can you recommend any natural products to keep vine borers away? Thank you. I do love the easy season-extension system that you referenced! Click here for the article Phil mentioned. First, let’s check out the critter we are talking about. 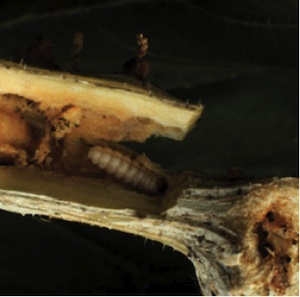 The squash vine borer, Melittia cucurbitae, is a segmented, cream colored caterpillar with a brown head. The borer measures about one inch long when full grown and looks grub-like. 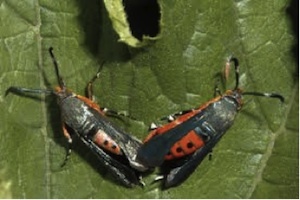 The squash vine borer adult is a clear-winged moth that is orange and dark grey with hairy back legs. The adult moth is active in the daytime (most moths are active at night), and can easily be mistaken for a paper wasp/hornet. 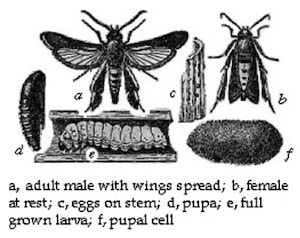 One moth can lay up to 250 eggs. Yikes – that is a lot of potential borers! The tiny flattened eggs are brownish and are laid individually (not in a group), so they can be hard to spot. The pupae overwinter underground and emerge as adults that will lay eggs on the squash vines. The eggs hatch and the larvae bores into the plants and begins eating – often causing death of the plant. There can be two generations of this pest in Western North Carolina. A sign…if your plant wilts suddenly, the most likely culprit is the squash vine borer. Check around the base of your plant for frass (looks like sawdust). If you see yellow frass coming from the base of the plant you can be fairly certain that the little devils have bored into your plant. Install a lightweight row cover* as an insect barrier at planting time. The row cover can be laid over the plants without support, or you can use supports (rods, etc.) if desired. Your objective is to make sure that the bottom edge of the cover is well secured against insect intrusion. The row cover must be removed when plants begin to flower so pollination can occur. Replant every 2-3 weeks during the growing season, so that if your plants die you have a backup crop ready. Early and late plantings may avoid the pest. Routinely check plants for eggs (usually on the stem near the base of the plant). Eggs are flat and brownish; they are laid individually rather than in clumps which makes them harder to locate on the plant. Squish eggs or drop them in soapy water. Wrap the plant stem with tin foil, pantyhose or cotton strips to prevent the moth from laying eggs on the stem. Wrap the stem from just beneath the soil up to just below the lowest leaf. Destroy squash vine borer moths. Scout for them in early morning or at dusk on the squash leaves. Drop in soapy water. A dead moth will not be laying eggs. Near nodes, cover the squash vines with soil at intervals. This will encourage auxiliary rooting and act as insurance if the main stem is compromised by borers. Rotate your crops. Ideally don’t replant cucurbits in the same place for at least three years. Lightly cultivate your garden soil in fall (with a hoe or tiller) and early spring – to about one inch deep – to expose the pupae to predators and to winter weather. Remove infected plants from the garden and dispose of them. One source recommended putting the vines in a black plastic bag for a number of days to heat-kill any invisible potential pests. Plant resistant varieties. All of the cucurbit family is susceptible to squash vine borer, but usually cucumbers and melons are not bothered. Squash vine borers are very attracted to summer squash (cucurbit pepo) like yellow summer squash and zucchini with their succulent stems. Hubbard squash (C. maxima) is a very susceptible winter squash that is sometimes used as a trap crop to lure borers away from other squashes. Of winter squash – Green Striped Cushaw (C. mixta) and Butternut squash (C. moschata) are the least susceptible and best options for ensuring a good harvest. C. moschata varieties are the most resistant squash varieties, so keep that in mind when selecting your seed. Be proactive. In early summer check plants frequently for signs of frass and act quickly. Frass means the borer is already inside your squash stems. Remove the borer. How? Follow the frass to the borer hole. With a sharp knife carefully slit the vine longwise, and remove and destroy the borer (squish or drop in soapy water). Check closely for multiple borers. Immediately cover the slit stem with soil to encourage rooting and healing. An Exacto knife would be ideal. Inject Bt into the stem near the borer with a syringe. Note that once the borer is inside the squash stem, they are well protected from insecticides. Spaying Bt or other insecticides on the outside of the plant will not target borers that are already inside the stem. For Bt to be effective on emerging larvae the Bt must be applied to the plant parts that the larvae will be eating (the lower stem). The large leaves of squash make it difficult to get good Bt coverage on the stem. Insecticidal soap (Safer soap) sprayed on the stem (at the base of the plant) in weekly applications can smother eggs. Soap must come in contact with the egg to be effective. Keep your plants healthy. Provide your plants with what they need to remain healthy and strong – adequate nutrients and adequate water. *Weight of row cover: For protection from insects use a very light row cover – something like Agribon 15 (weighs .45 oz. per square yard and allows 90% light transmission). It is not heavy enough for frost protection. Agribon 19 (which weighs .55 oz. per square yard with 85% light transmission) can do double duty; it is light enough to use for insect control but still offers some frost protection for overwintering plants. Row covers that are any heavier than Agribon 19 are too hot for summer use and offer poor light transmission during the growing season. An expensive (but sturdier) alternative would be an insect screening fabric. Phil, I hope you have a fabulous growing season and that the techniques you choose to use will keep the borers at bay. Use as many of these techniques as possible to maximize your success. Ruth Gonzalez is a former market farmer, gardener, and local food advocate who wants to see organic farms proliferate and organic gardens in every yard. 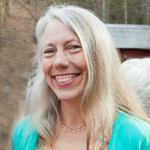 She serves on the Organic Growers School Board of Directors, and in her job at Reems Creek Nursery, Ruth offers advice on all sorts of gardening questions, and benefits daily from the wisdom of local gardeners.